I attended the University of Texas, in Austin, pursuing a degree in aeronautical engineering. I had to work part time, which was very difficult because a lot of employers want you to dedicate the majority of your time to your job. They don’t understand that you’re in college and that’s what you’re really focusing on. So I decided to take a break and take some time off to gather my thoughts. "You get limitless opportunities to learn and experience so much more." Since I have family that has been prior military, it was suggested to me that I think about joining the Military. That was the first time I considered going into the Military. I felt like I wanted something different than just the regular routine. I enlisted in the Army in March of 2005 as a combat engineer, with plans to go into Special Forces. I got my initial request for assignment, Hawaii, which was great! While I was there, they offered me a variety of opportunities to go to school and advance my career before going to Special Forces. Unfortunately, during the physical training portion, I injured my knee. Luckily, I was given an opportunity to continue to serve my country and was told I’d have to switch jobs. 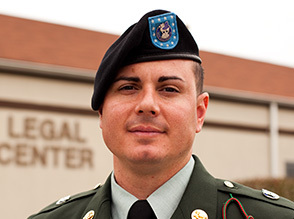 I chose paralegal specialist, and the Military sent me back to school in Fort Jackson, S.C. They trained us in writing legal memos for attorneys, doing legal research and transcribing. They touch on everything that you would possibly come into contact with in the paralegal field, whether you’re a court reporter, in criminal defense or in criminal prosecution. That’s because every time you change duty locations, the possibility of changing job specialties is there also. I am always training to improve myself as well. Just because I’m a paralegal doesn’t mean that’s the one and only thing I’m going to do for the rest of my life in the Military. If I have to get deployed, just knowing my job and duties as a paralegal isn’t always going to be enough, so knowing how to react to emergency situations is a must. As a paralegal, an average day usually consists of preparing legal documents for the attorneys I work for, investigating or interrogating some of the witnesses that we have for court, scheduling appointments and researching law. In court, my job is to make sure that the facts come out and that everybody receives a fair trial. 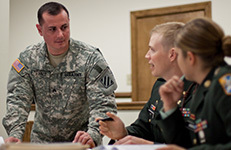 A military court-martial is very similar to a civilian court hearing. We go through the same process. If I were to do my job as a civilian paralegal, I would feel confident enough to be able to do it just as well or better because it is so closely related. The most important value that I’ve learned in the Military is integrity. Integrity is a value that a lot of people lack because many times they aren’t able to be responsible for what they do and who they are. Just by joining and being in the Military, you get limitless opportunities to learn and experience so much more.